As we all know, an unprecedented volume of brand-name drugs will lose exclusivity and face generic competition over the next four years. 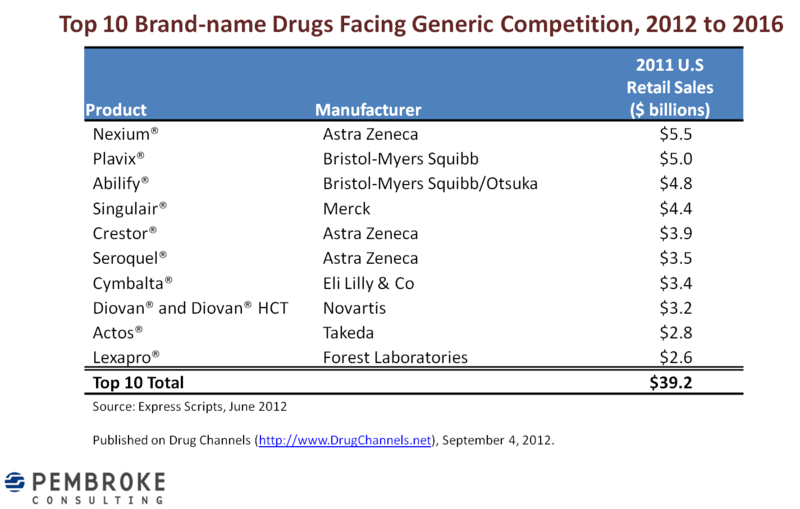 Below, I take a look at the latest projections for brand-name drugs that will be facing generic competition, courtesy of newly-published data from Express Scripts. 2013 generic launches will be only one-quarter as big as the 2012 generic monster. Generic launches will rebound and remain high throughout 2014-2016. From 2012 to 2016, just 10 blockbusters will account for half of total brand-name revenues lost. The generic cliff is now projected to be steeper, with an 84% drop in 2017. 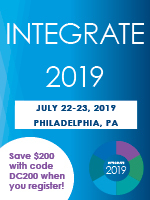 While brand-name manufacturers may feel like they're barking up the wrong tree, drug channel participants—pharmacies, Pharmacy Benefit Managers (PBMs), and wholesalers—will be surfing in true canine style. Back in the day, Medco Health Solutions used to publish a detailed list of brand-name drugs that will be facing generic competition. Express Scripts is continuing this helpful tradition with its recently updated, 11-page list: Estimated Dates of Possible First Time Generic/ Rx-to-OTC Market Entry. The list identifies 192 brand-name drugs, the generic name, common uses, 2011 retail sales, and the best-guess expected date of generic competition or (more rarely) an Rx-to-OTC switch. Express Scripts assigns 100% of a brand-name drug’s sales to the quarter when the generic launches. (For simplicity of presentation, I did not show quarterly estimates.) The revenue estimates are based on 2011 U.S. retail sales and are not adjusted for price inflation. To create the chart below, I added the older Medco data from 2011 to mid-2012. The chart below illustrates the pace and entry of generic drugs projected by Express Scripts, as of June 2012. From 2011 to 2021, brand-name drugs with $105.2 billion in sales will face generic competition. By 2016, the generic dispensing rate (GDR)—the percentage of prescriptions dispensed with a generic drug instead of a branded drug—could reach 88%. The near-term generic pipeline contains many blockbuster, retail-dispensed products. From 2012 to 2016, brand-name drugs with retail sales of $77.2 billion will lose patent protection. 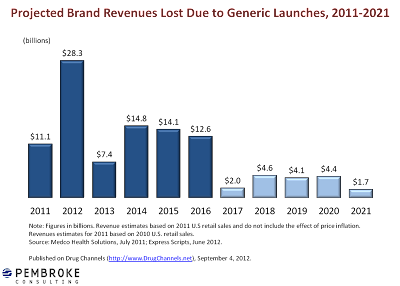 Of the 117 drugs in this period, just 10 products (9%) will account for 51% of brand-name revenues lost. 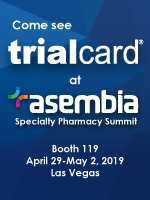 Historically, pharmacy gross dollar profits per prescription are highest during the 180-day exclusivity period, and are even higher when an authorized generic competes with the first-to-file ANDA generic drug. See Pharmacy Profits from Authorized Generics. Big question: Will this historical profit pattern continue during the generic wave, given: preferred networks; a retail pharmacy price war; aggressive MAC'ing by payers; Average Acquisition Cost (AAC); and retail-at-mail pricing? Hang loose, dude. P.S. Your eyes did not deceive you. 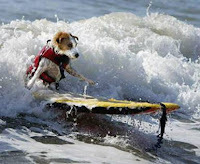 Pictured above is Buddy, the world famous surfing dog from Ventura, CA. (Of course!) As far as I know, Buddy is not licensed to prescribe or dispense pharmaceuticals...yet. So with $105 billion in brand name sales gone from the pie, how will the generic savings be distributed between insurance companies, PBMs, pharmacies, employers and their employees? I'm confused. How do pharmacies make any money in the first 180 days of single source generics. Most TP contracts are AWP minus a percentage on the generics. When single source AWP is 80% of the brand and the cost is 80% of the brand, the math doesn't work. See: generic Adderall, generic Concerta, generic Lipitor, and a whole host of others.